The dividing lines seem to be everywhere with Marvel's Captain America: Civil War. The latest battle is not that of abilities, but rather that of functionability, as Anthony Mackie was asked to weigh in on whether The Falcon or Iron Man's suit was tactically superior. Obviously, Mackie sided with his character's appearance, and for a pretty big reason: maneuverability. I feel like I have more maneuverability, I feel like I have more weapon's capability, and what's interesting about my suit as opposed to [Iron Man and War Machine,] their suits look the same. 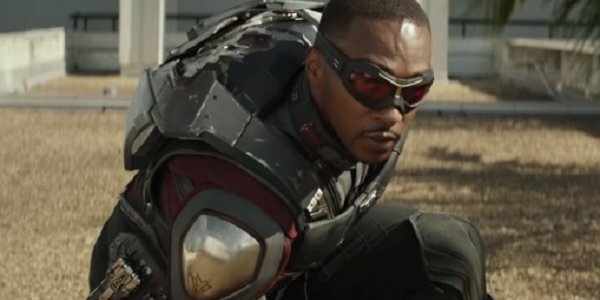 As awesome as The Falcon's wings really are, Anthony Mackie's assessment is both right and wrong in its merits. On the correct side of the spectrum, maneuverability is the key advantage that The Falcon has with his winged apparatus. It's clear as day, and the exclusive clip from Captain America: Civil War that was shown at the MTV Movie Awards was the best proof of that fact. Even taking into account the fact that Falcon's wings do rely on a jet pack for thrust, his jet pack surely isn't as powerful as an Iron Man suit from Tony Stark's lab. With wings instead of repulsors, Sam Wilson has more control over how and where he moves. However, there's one big advantage that Mackie chalked up for his alter-ego, only to have reality move it back into the opposition's column, and that's weapons capability. While The Falcon has Iron Man and War Machine beat when it comes to maneuverability, he definitely doesn't have them beat in the arena of armaments. Unless Captain America: Civil War sees the "Tony Stark-erized" wings of The Falcon being able to house sophisticated targeting computers, a metric ton of mini-missiles, and anything close to the capability of an Arc reactor, chances are that Tony Stark and Col. James Rhodes could fire more rounds of more weapons in a second than Anthony Mackie's Sam Wilson could through his trusty pistols. The war of agility may go to The Falcon, but the arms race goes to Team Iron Man in a heartbeat. Though when all is said and done, the fight over whose suit is more powerful highlights the divisive nature of Captain America: Civil War's central conflict. With the Sokovia Accords and the Superhero Registration Act dividing the world's mightiest defenders into two separate factions, every advantage that either side can claim to possess will make all of the difference. We don't know how exactly the war will be won, all we know is that Captain America: Civil War's May 5th release date hasn't arrived soon enough.